Disclosure: This is a compensated campaign in collaboration with Cacique Inc. and Society Culinaria. Herein, all opinions are honest and my own. Thank you for supporting the brands I consume and make this blog possible. … and you know what? 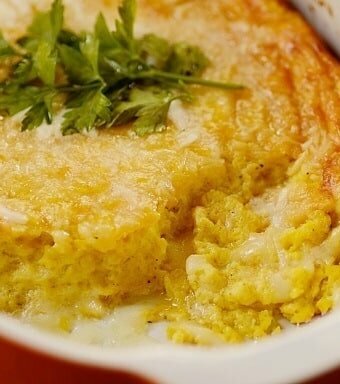 The result is a smart side dish that actually combines the best of two dishes into one – cream of corn and a cheesy gratin (which are similar to the Brazilian casserole, creme de milho). 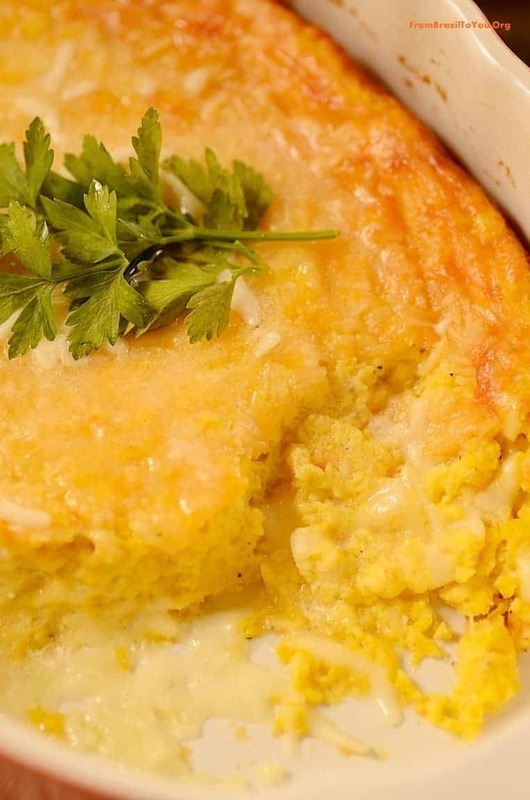 Yet don’t be fooled by its simplicity… This creamy corn gratin has a souffle-like consistency, a delicate balance of flavors, and is both comforting and elegant. In other words, it pays back big without making you slave over the stove while preparing your holiday feast. 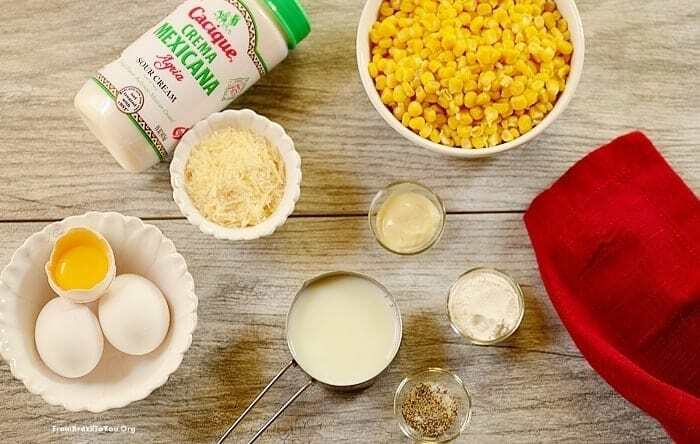 Another advantage is that all of the ingredients — canned corn, milk, eggs, flour, butter, cheese, seasonings, baking soda, and Cacique Crema Mexicana Agria (a Grade A Sour Cream) — are economical and widely available at local supermarkets. For those who may not know, the Cacique Crema Mexicana Agria is a cultured Grade A sour cream with a Mexican flair. It is thick (but not gelatinous like other sour creams), buttery, slightly savory, and has a rich mouthfeel with the perfect balance of heavy cream flavor and tart tang. It is a versatile product that can be used in all recipes and dishes that call for regular sour cream. This means you can use it in quesadillas, tacos, baked potatoes, or chili. 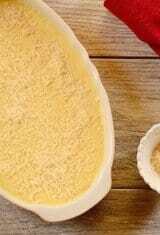 It also makes a great base for soups, sauces, dips and dressings… and of course, for our creamy corn gratin, providing a bit of tang to balance the sweetness of the corn. But that is not all! Cacique also has a line of other cremas and a variety of products to enhance your Thanksgiving dishes, including its Crema Mexicana and Crema Salvadoreña. 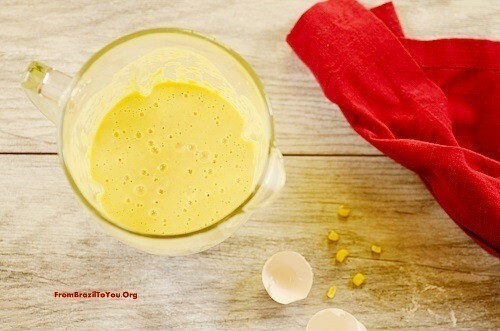 For more info on Cacique products, go to www.caciqueinc.com… and for other yummy recipes, visit their Go Autentico Blog. 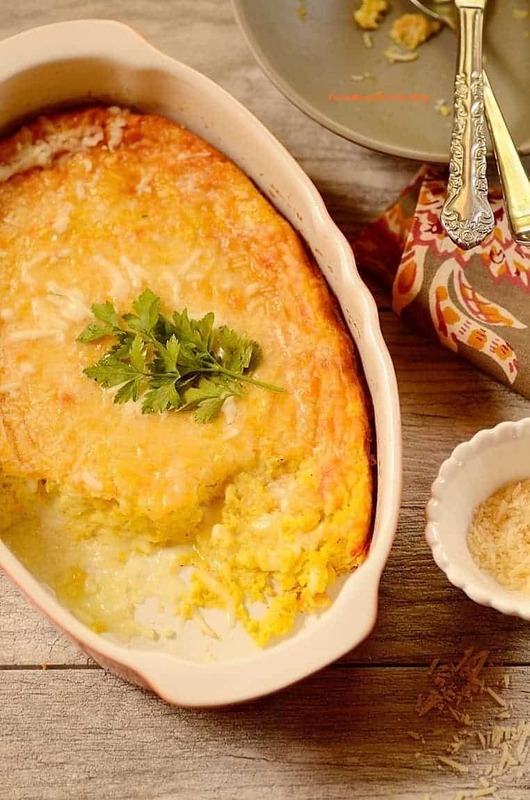 Enjoy our tasty creamy corn gratin and have a marvelous Thanksgiving! 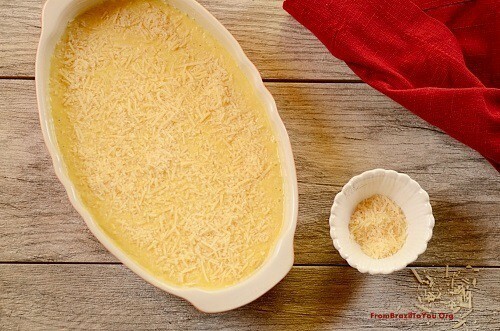 Creamy corn gratin is a tasty, easy, and quick side dish made by blending most of the ingredients and baking in the oven. It's great for Thanksgiving and can be prepared ahead. Preheat the oven to 375 degrees F. Butter a 1.5-quart gratin dish and set aside. 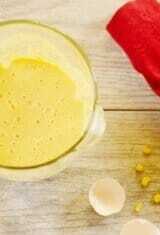 In a blender or food processor, blend or process well the milk, crema, and corn kernels together until smooth. Add the eggs, flour, salt, pepper, and baking soda blending or processing a few times just until obtaining a homogeneous mixture. Stir in shredded provolone cheese if desired. Pour the mixture into the buttered gratin dish, and sprinkle Parmesan cheese over the top of the dish. Bake for 30-35 minutes, or until golden brown on top. Serve hot and enjoy as a side dish! Dish can be prepared one day ahead, refrigerated, and then baked 30-35 minutes prior to serve. Our children all love creamed corn so this would be a terrific dish to make when they are visiting. Enjoy, Karen! My husband is not crazy for corn dishes but he ate this and enjoyed it. I am a fan of corn… and this is in my holiday list! Denise, this looks fantastic, really creamy!!! Making Thanksgiving side dishes the day before the holiday is such a grand idea! Especially when cheesy corn is involved! A most scrumptious side dish. We just bought some fresh organic (of course GMO-free) corn, so the timing couldn’t be better dear Denise!!! Unfortunately, even though we’d LOVE to try the sour cream you suggested, it’s not available here. Can we use Greek yogurt instead? :/ Does that sound like something you’d try? Hi, Panos and Mirella! No worries. Absolutely! You can use either Greek yogurt or heavy cream instead. If using Greek yogurt, still add the baking soda. If using heavy cream, skip the baking soda. Enjoy!!! Sending you hugs and best regards from Texas. Looks like my idea of a perfect side dish! Your grated corn looks fantastic, perfectly browned and so inviting.